200 gluten-free recipes to help you lose weight while following the Wheat Belly diet. 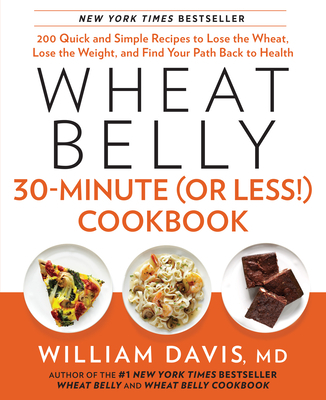 Wheat Belly shook the foundations of the diet world when author and renowned cardiologist William Davis revealed that an epidemic of adverse health effects—from mysterious rashes and high blood sugar to stubborn belly fat (so-called "wheat bellies")—could be banished forever with one simple step: Saying goodbye to wheat. The Wheat Belly Cookbook built on that foundation with hundreds of delicious, family favorite recipes with a wheat-free makeover. Now, with Wheat Belly 30-Minute (Or Less!) Cookbook, it's easier than ever with this collection of yummy recipes that are quick enough for busy weekdays—and good enough for company. You will find an introduction to the ABCs of wheat-free cooking, plus a guide to prepping the kitchen, stocking the pantry, and getting started on a healthy new path. Beautifully illustrated with full-color photo inserts, you will enjoy these delicious recipes for breakfast, lunch, dinner, side dishes, snacks, desserts—and even special occasions.